If it looks cold - it was ! Well it is a very glad Quentyn who is back from the Bosbaan leaving 1/2 way through a 2 day session. Normally I would be annoyed about leaving half way through planned session but after the 1st night i though I would quit whilst the going was good. Here is a tip for you, if you are packing to go fishing and you shake your cooking gas bottle and think “hmm I wonder if there is enough in there for 2 days” there is not. The meerest action of checking ensures that there is not. Now in the summer you can get away with no hot water, in the winter it could be deadly. Well you have guessed it, during the 1st night I went to make a cup of tea and found that in the cold my gas bottle was almost empty with not really even enough grunt to warm 1 kettle of water. Lesson to be learned I feel and my thanks to Mick to popped along in the morning with a hot flask of tea which was very welcome. 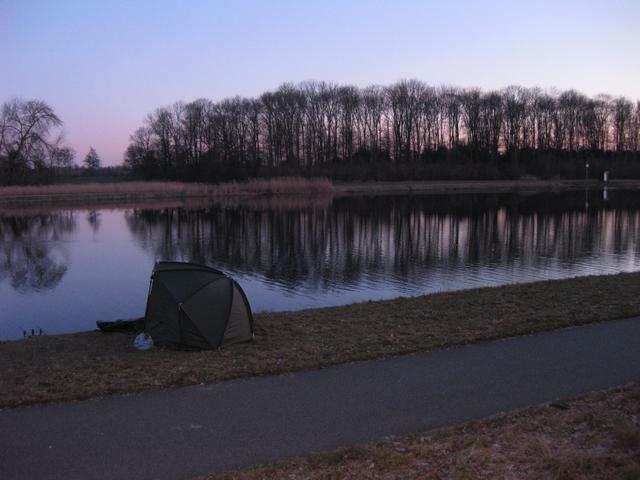 On to the fishing, when I arrived at Bosbaan I was not surprised to find someone camped out in swim 1, under the tree as this is always a popular swim and as the wind was a NE wind I decided to fish the other end anyway. I was surprised to find a group of anglers at the other end however and as darkness was approaching and I knew it was going to be a cold night I decided to fish as far as I could towards the windward end whilst not fishing too close to either the over head lines or to the other anglers. As it was really the 1st fish able weekend after the intense cold I decided to opt for highly flavoured boilies and only small PVA bags or single glugged popups. Whilst I was in my local fishing shop the other day I notice that Dynamite have just released a new tutti frutti flavour ( which doesn’t show on their website 😦 ) however I could smell them across the shop, subtle they are not. They brought back happy memories of using richworth tutti frutti boilies when I was very young, I decided I had to have them. The other rod was set up with a CCmoore 15mm perfect Pineapple pop-up that has been marinading in the pineapple booster liquid for weeks and so is fully saturated. 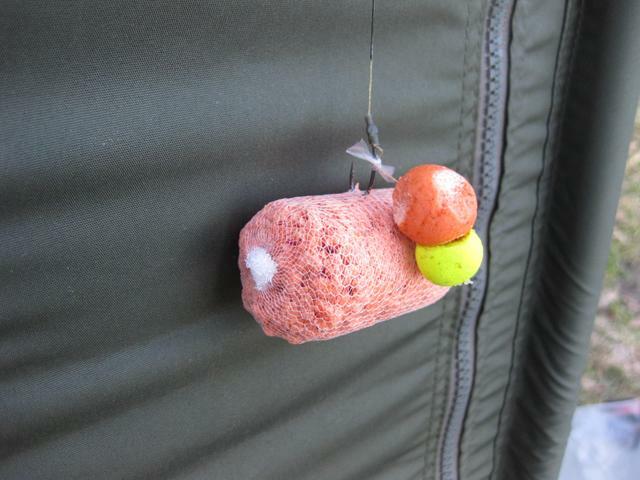 This was then presented as a chod rig with no freebies or other baits around. After a few hours of moving the baits every 30-40 mins searching for the fish I decided to place them both in some likely looking areas and bed down for the night. Just after I buried myself in the sleeping bag, Nico, one of the other anglers from up the bank popped over to ask if I had caught anything. I was just giving my reply when, beeeeeeeeeeeeeeep ! the chod rig rod was away. After a strange fight ( wasn’t even sure it was a carp) the fish was safely ensconced in the net and it was time to dig out the weigh sling and the Korda carp care kit . I was off the mark ! I always feel a great sense of relief when you have a fish in the bag, it is almost like you can relax as if noting else you have not blanked. My thanks to Niko for the pictures of this fish as it was really too cold to be messing around with self takes and I was glad for his help. One think I would like to point out was that this fish was caught on the exact rig that I made here, a lot of people show how to make rigs but never show you the results. 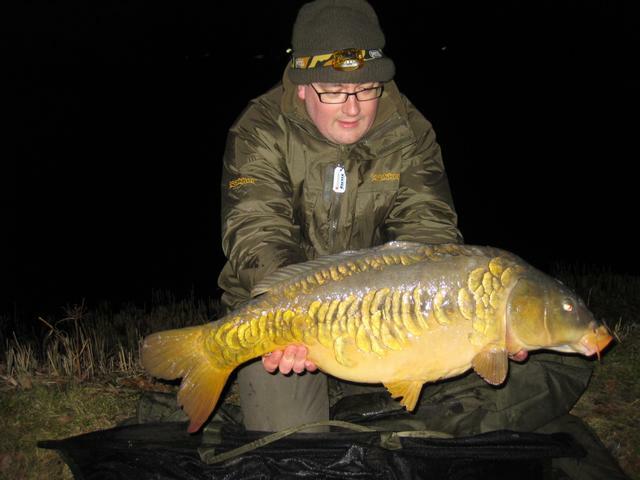 Well this is the fish that that particular rig caught. Not as pretty scale wise as the 1st but that huge tail really allowed it to fight hard. 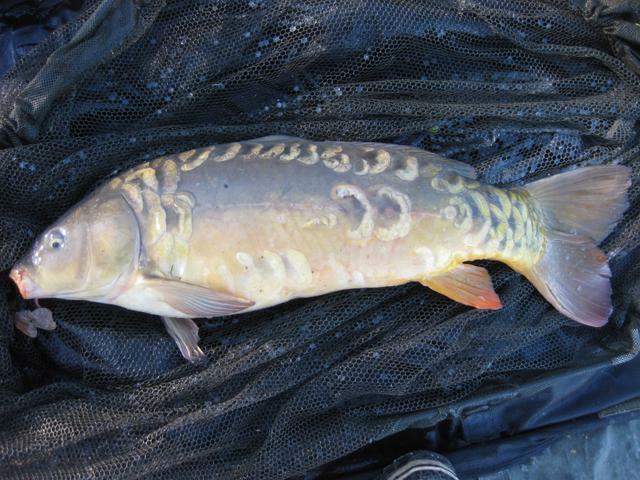 After a bit of treatment for a previous mouth injury the fish was returned to the water to get back to eating boilies. 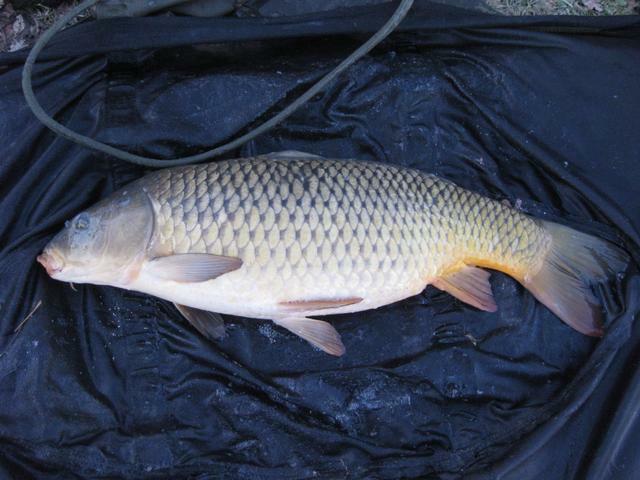 One thing that was strange was that this fish was really excreting a red bait, I don’t know who as fishing with red boilies but this fish loved them and was pooing then out all over the place. 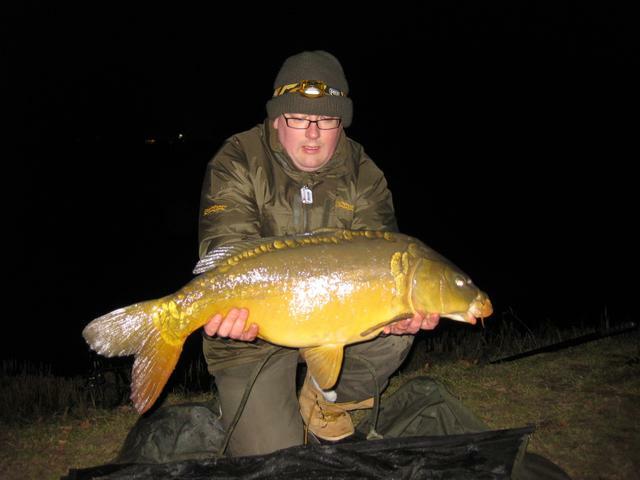 The rest of the night was uneventful and the fish didnt return till the morning when a brace of 15lb fish made themselves known. As I had good pics of the 18’s and as it was really really cold I just snapped a quick pic on the mat before returning them. Both were a welcome addition to the tally and along with another small common ( <10) that I released immediately brought the total for the session to 5. Not bad for less than 24 hrs and certainly not bad for a winter session of less than 24hrs.